The Shroud of Turin, the alleged burial cloth of Jesus, is on display during 2015 in the city of Turin, Italy. Many thousands, if not millions of people, will visit Italy this year just to gaze upon what may in fact be the linen cloth that held the body of Jesus as He lay in that tomb over 2,000 years ago. My wife and I visited Italy in 2010, during a previous exhibition of the Shroud of Turin. It is a most amazing piece of cloth. The almost ghostly image of a tortured man (a reverse image by the way), is faintly visible on the cloth. 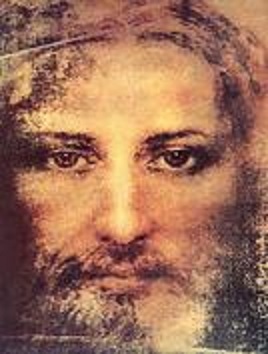 We have another article on the Shroud, but in this article I want to discuss how the Shroud of Turin displays evidence for the fulfillment of prophecies in the Bible about the coming Redeemer of Israel, and indeed of all human beings. 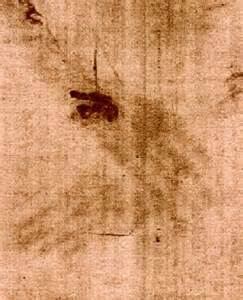 Furthermore, the Shroud lines up precisely with what is recorded in the gospels about the capture, torture, and crucifixion of Jesus. It is a tightly woven herringbone twill made in a single piece. On it can be seen a reverse (positive) double image (front and back) of a human body which has been tortured and beaten, with wounds visible on the left wrist, on the feet and on the right side of the chest. Aramathea prior to sundown on Friday afternoon, so that Jesus could be wrapped in something prior to burial. About 35 centimeters (~14 inches) from each edge and running lengthways down the cloth are two almost symmetrical lines of scorches.The most evident scorch marks were caused by the fire which broke out during the night between 3 and 4 December, 1532 in the choir-sacristy of the Sainte-Chapelle in Chambéry, where the Shroud was kept in a silver-plated casket. The intense heat of the fire caused a drop of molten metal from the lid of the casket to perforate the cloth which had been folded into forty-eight layers. The water used to put out the fire left its mark on the Shroud as well. 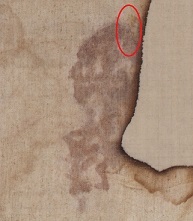 There are also older traces of combustion which run along two parallel lines at the level of the crossed hands(frontal image) and at the same level of the back (dorsal image) of the Man of the Shroud. the pinkish stains are instead due to the presence of blood on the cloth. The blood stains have been confirmed through extensive analysis to be actual human blood, of type AB, and of a human male (see below for more on this). There is no explanation for what or how the body print was made. It has been confirmed that it is not a painting. 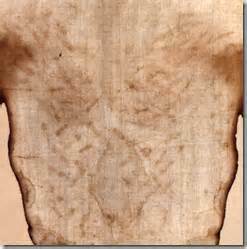 Some believe the body print was produced as a by product of Jesus having been raised from the dead, as Christians believe, and as the Bible records. Psalm 22:18 “They divide My garments among them, And for My clothing they cast lots”. The legs of the man are crossed, but not broken – as was the usual custom of Roman soldiers to do when dealing with crucified victims (the legs were broken while they were on the cross, to speed the arrival of death). Psalms 34:20 “He keeps all His bones: not one of them is broken.” God went to great lengths to prophesy about the bones of Jesus. It was told that Jesus would receive “stripes,” but none of His bones would be broken. The legs of the two men crucified to the left and right of Jesus had their legs broken by the Roman guards – but not Jesus. David was inspired by Christ to give us this Messianic prophecy. The frontal image shows the head and face of a 1.80 m (~5.9 feet) tall man with long hair, a forked beard and a moustache. The more marked hair mass on the left side of the image suggests that the head was slightly tilted to that side. 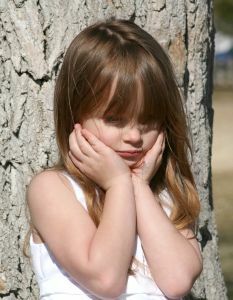 Pinkish stains are visible on the hair and face. John 1:18: “No one has seen God at any time. The only begotten Son, who is in the bosom of the Father, He has declared Him.”. on the right check, on the upper lip and on the jaw. In the New Testament, we read how that Jesus, after He was captured by the Romans, endured a terrible beating about the head, face, and in fact over His entire body by Roman guards who were ordered to scourge his body by means of a Roman “flagrum” (a whip which had pieces of metal attached to it for the purposes of tearing flesh from a body). The wounds on the Man depicted on the shroud are what you would expect to see of a Man who was put through that kind of torture. .
On the right of the chest there is the image of a cut about 4.5 centimeters (~1.5 inches ) long by 1.5 centimeters (~0.4 inch) wide from which a large bloodstain emerges. It is possible to see the two forearms with the left hand crossed over the right wrist at the level of the pubis. Psalm 22:14 “I am poured out like water, and all my bones are out of joint”. 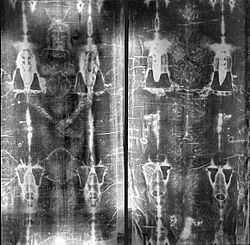 Scientists and medical experts who have studied the shroud have commented that the arms appear to be unusually distended, as though the arms were pulled out of their sockets. Although not specifically quoted, the Roman practice of crucifixion usually resulted in both arms being pulled out of joint. Bloodstains are clearly visible on the left wrist and on both forearms. On the dorsal image a series of blood rivulets run down around the nape of the neck. The dorsal image also shows the feet, above all the right foot. In the central part of the right foot there is a clearly darker area which corresponds to the nail wound. Two different rills of blood run from this wound, one towards the toes and one towards the heel. Scourge marks spread from the tops of the shoulders to the ankles. There is also a transversal blood flow extending right across the small of the back. Scourge marks are more prevalent in the back side, and run in groups of two and three. The marks run horizontal and diagonal, and vary in intensity from light contusions to deep punctures. Medical examiners believe these marks are evidence that the scourging was caused by a whip or cord-like device (a Roman “flagrum“). “Who has believed our report? And to whom has the arm of the LORD been revealed? He is despised and rejected by men, A Man of sorrows and acquainted with grief. And we hid, as it were, our faces from Him; He was despised, and we did not esteem Him. Surely He has borne our griefs, And carried our sorrows; Yet we esteemed Him stricken, Smitten by God, and afflicted. Shoulder Injuries show evidence of scraping against a heavy rough object. The dorsal side of the shroud show scourging marks as well as abrasions along the back sides of the shoulder blades, as from carrying a heavy rough object. There is evidence of actual human blood on the Shroud. 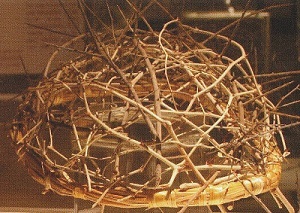 During the 1978 testing by STRUP, sample fibrils were removed from several blood stained areas of the shroud. Numerous tests run by the team confirmed that real human blood is present on the shroud, even identifying it to as blood type AB. Further tests in 1997 identified ancient DNA present in the blood samples. Both x and y chromosomes were detected, confirming that the blood was from a human male. The DNA was also in a very degraded state, which is consistent with ancient DNA. 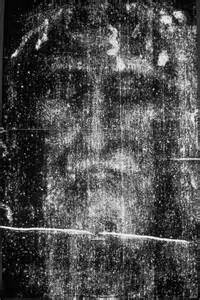 For more on the bloodstains on the Shroud of Turin, visit http://theshroudofturin.blogspot.com/2013/02/the-shroud-of-jesus-25-bloodstains.html. The Shroud was on display during the summer of 2015) in the city of Turin, Italy. 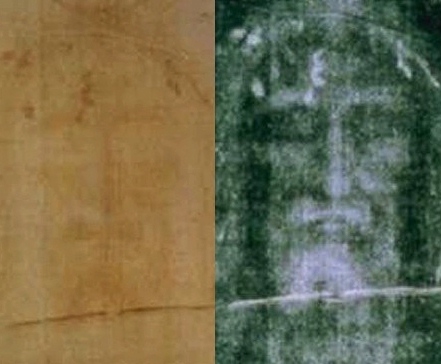 From the weight of evidence, this may in fact be the burial cloth of Jesus – and if it is, it is the most important ancient artifact in existence; and strong evidence for the existence and sacrificial death on the cross of Jesus of Nazareth, the One whom Christians proclaim as the Messiah, the risen Savior of all humans who believe and trust their lives to Him.